Christmas is coming, folks. Yeah, kind of scary, but I love the lights, white lights, twinkling lights, colored lights. I usually have a small Christmas tree. It’s tall and narrow, and I load it up with lights, and then I sit in my comfy chair every evening and enjoy the lights. It brings me back to my childhood. Last year I made some videos on how to make your own Christmas cards. It was kind of late in the game, so this year, I’m posting them early just in case you want to try to make your own. Here is the link to the whimsical Christmas village CARD. I don’t have a picture of it because I lost all my picture files for the last part of 2015, but if you click the link you can see the card at the beginning of the video. I’m going to have another e-course sale starting tomorrow. This time I’m offering my ART AS ORACLE on sale for $27. It’s usually $55, so it’s a great deal for sure. 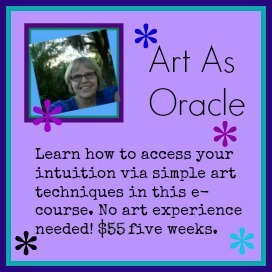 You will receive five weeks worth of material and if you join my Facebook art group, I will help you to interpret your intuitive art explorations. This is psychic, intuitive art. You can read all about it HERE, but the price won’t change until tomorrow. Previous PostPaper shrinesNext Post50% off sale!